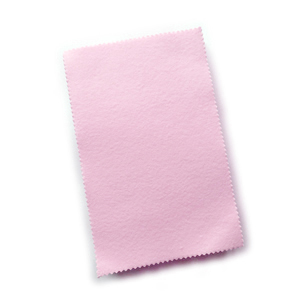 The Pink Sunshine® satin finishing and polishing cloth is a double-action cloth. It has two different abrasive sides. The sand paper side adds a fine satin finish to metal; the polishing cloth side cleans and puts a high shine on finished jewelry, gold, silver, brass, copper, and most other metals leaving a deep, long-lasting luster. 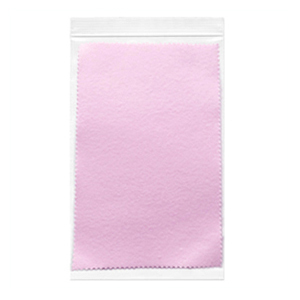 To apply a fine satin: Using medium pressure, rub your jewelry surface with the abrasive dark pink or purple side of the cloth until a find satin effect emerges. 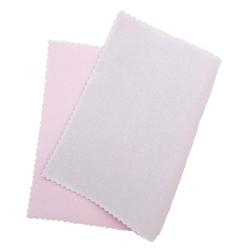 To clean and polish: Using medium pressure, rub your jewelry surface with the polishing light pink side of the cloth. Special satin finish and polishing actions, on each side, will work until that side is completely darkened. Do not wash the cloth. Made in Japan. Pink Tubes are not currently available.